Herbal teas are very popular and if you drink a quality product they have medicinal properties. Relatively unknown in the states is Chaga tea. Chaga is not a plant, it is a fungus (Ononotus obliquus) that grows on birch trees in cold regions such as Siberia, northern Canada and Alaska. Throughout much of Europe and Asia, Chaga has been hailed as a “gift of God” due to its restorative powers. Traditionally, Chaga has been consumed by indigenous Siberians to prevent the onset of degenerative disease, to boost physical stamina and attain long life. An interesting comparison is between the Inuit and Siberians who lived in relatively similar climates. The Inuit did not use Chaga and on average their lifespan was only 40-50 years. The Siberian tribes that consumed Chaga routinely lived to 90 to 110 years. Coincidence? In Russia and other parts of Europe, Chaga is considered a cancer cure. The Ojibwa of northern Canada regarded it as a cure for tumors. In Korea it is used to fight stress and regulate energy. In Europe it has been used to fight inflammatory skin conditions including psoriasis and eczema along with bronchitis and lung disease. What is So Special About Chaga? SOD: Chaga is known for its high content of superoxide dismutase (SOD), an enzyme that functions as a powerful antioxidant. SOD performs a vital antiaging function by neutralizing free radicals preventing oxidative stress. Oxidative stress is a slow chronic killer that while a natural part of cellular function often gets out of hand with our modern lifestyle. Oxidative stress is one of the functional markers I test when working with clients. The best way to increase SOD levels is with food, as supplements containing the enzyme are often difficult to absorb. Good sources of SOD include peas, dark leafy greens, nutritional yeast, wheat germ, beef heart and raw liver. 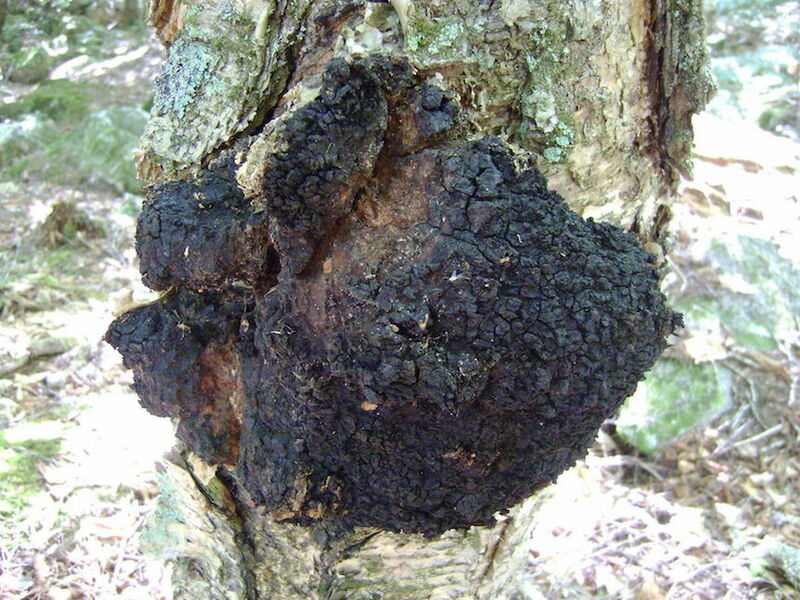 While nearly all muscrooms are rich in SOD, Chaga has the highest concentration. It is 50 times higher in this enzyme than reishi. Chaga is also rich with vitamins including vitamin K, D and several B vitamins. Its mineral content includes calcium, iron and manganese all very bioavailable. Immune Defense: Chaga has natural antimicrobial properties allowing it to effectively combat numerous bacteria, fungi, viruses and even some parasitic worms. The polysacharrides are useful in promoting the production of white blood cells. Chaga helps many facets of the immune system, not only against pathogens but also for its anti-inflammatory and antipyretic properties. Chaga also has a number of phytosterols. These cholesterol-like substances can serve as precursors to cholesterol supporting cell membrane stabilization, healthy hormone production and other vital functions. Anti-Cancer: Possibly its most impressive property is its effect on cancer. Chaga contains betulinic acid which has the ability to induce apoptotic cell death in cancer cells. http://www.ncbi.nlm.nih.gov/pmc/articles/PMC2658785/. What About Clinical Studies? Around 900 clinical trials have been performed with regards to SOD’s health benefits. Cancer patients undergoing radiation who were given SOD in a form that could be absorbed had better rates of survival, less toxicity, less scarring and better wound healing. Hear is a link to one study. http://www.ncbi.nlm.nih.gov/pmc/articles/PMC3774877/. Is the Chaga source Important? Absolutely yes! The properties of Chaga are enhanced if it is encased in birch bark when harvested. We mentioned the Betulin and betulinic acid. This is metabolized from the birch bark itself upon which the Chaga grows. There appears to be a symbiotic relationship between the birch tree itself and the Chaga. There has been discussions between which is best, Siberian or Canadian Chaga. It has been found that the older the Chaga, the higher the levels of SOD. To get old Chaga, you need old birch trees, and parts of Canada, have many 200-300 year old birch trees. Ideally, what you are looking for is old chaga coming from Canada that was harvested from live trees with the birch bark intact. Chaga that fits this mold is not that difficult to find. In fact I have found two sources that I recommend and actually consume. My first introduction to Chaga was when I visited Newfoundland in 2015. 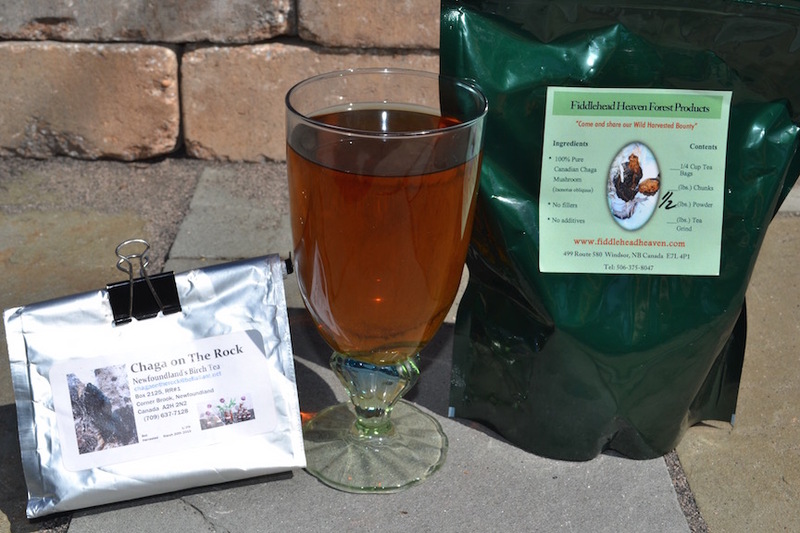 I came upon Chaga tea from a small retailer. The brand is Chaga On The Rock. Most recently I happened upon Fiddle Head Heaven based in New Brunswick. They appear to be doing everything right with regards to harvesting and packaging. Just had a pound of Chaga shipped to me. The shipping price was very reasonable and expedient considering it had to cross the border. How Do I Prepare Chaga? To optimize the benefits I suggest placing a gallon of filtered water in a non-reactive pot on the stove at the lowest temperature possible. You don’t want to bring the temperature above 125-135 degrees. Place a quarter cup of ground Chaga into a disposable paper tea bag or tea ball and steep for 5-6 hours. The tea can be drunk warm or cold. If placed in the fridge, use glass bottles for storage. You can add lemon, honey, cinnamon or cloves or even mint. I prefer mine straight, nothing added. It has a bit of an earthy taste but nothing unpleasant. The key is that you actually drink it and I suggest 4 cups per day. More won’t hurt. What Can I Expect? That is a difficult question, here’s why. The degree that Chaga or any variable you change or add works ,depends upon the degree that the variable impacts an aspect of your dysfunctional metabolism (Metabolic Chaos™) that is directly or indirectly related to your particular health challenge(s). This is why one individual responds very favorably to a protocol while another may notice nothing. Considering the possible health properties Chaga contains, I feel it is well worth adding to your regimen. Even better, it’s not expensive. A one pound bag of ground Chaga should last about 3 months if you consume 4 cups daily. If you give it a try, let me know what you think. If you are dealing with any serious health challenges or conditions you may want to check with your health practitioner first. Not so much because of risk but so they know what you are doing that makes you feel better.